If you had a set of delightful 19" Volk Racing RE30 wheels at your disposal what would you do with them? I bet your first answer isn't "coat them in 24 karat gold". If it was you might be Ben Schaffer from Bulletproof Automotive and you would have already done it anyway. 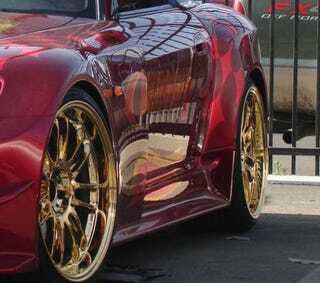 On top of the wheels of gold, Mr. Shaffer also has a gold Honda S2000 and we're wondering if he also has set of gold roller skates and a problem with eczema. He loves goooold!